Several years into its turnaround, the healthcare real estate giant is still pricey, but it also has solid long-term prospects. It's been just over one year since I wrote an article about Welltower Inc. (NYSE:WELL) under this exact same headline. My conclusion at the time was that its shares were a bit pricey, but I really liked the company's long-term prospects and thought that the dividend should make it easier to ride out the potential ups and downs. Since that article was published, Welltower stock is down about 6.5%, and it was down as much as 28% at one point. While I didn't exactly predict it would fall so much or remain down, it's not surprising, considering the company is still in the process of making changes to its portfolio of properties and the areas of healthcare it intends to focus on. These factors coupled with rising interest rates mean there's still uncertainty about Welltower's path forward. Welltower isn't cheap, but a major demographic shift should prove very good for business. Image source: Getty Images. Yet even with that uncertainty and less-than-stellar results in recent quarters, my long-term thesis for Welltower remains the same: Its stock isn't cheap and could continue to be volatile, but over the long term, I like the company's prospects. Keep reading to learn why. Welltower has spent much of the past few years working on a new strategy aimed at increasing the percentage of cash flows derived from patients with private insurance. It has made substantial progress, moving from 69% of its net operating income from private pay in 2010 to well over 90% today. Part of this strategy has also included selling off other properties, particularly skilled nursing facilities, which tend to house more patients and residents relying primarily on Medicare for health coverage and typically not having any private insurance to cover long-term care expenses. WELL FFO Per Share (Quarterly) data by YCharts. WELL Funds from Operations (Quarterly) data by YCharts. On the surface, it also may look like Welltower hasn't really done much to improve its balance sheet. 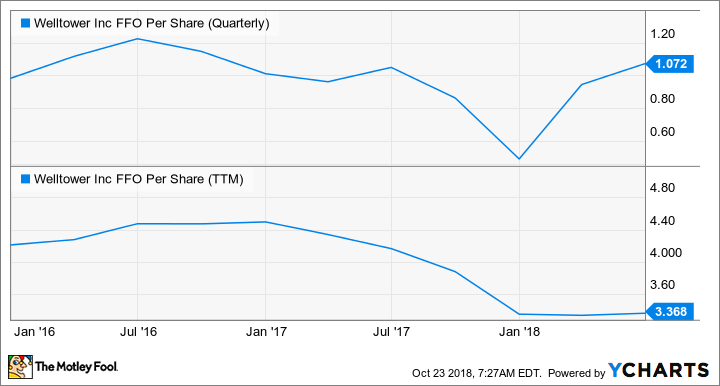 After bringing its total long-term debt down from more than $13 billion in 2016 to less than $11.5 billion in early 2017, the company has yet to take another move to pay down more debt over the past year. To the contrary, Welltower's debt could go above $12 billion when it reports earnings in late October. When it reported second-quarter results, the company announced it had closed on a new $3.7 billion unsecured credit facility. In August, Welltower made another move to secure more capital, closing on $1.3 billion in senior unsecured notes. But there's more than meets the eye with those moves. The unsecured credit facility announced in the Q2 earnings release replaced a prior facility, and the company said it was at better -- read: cheaper -- terms than its prior facility. It also gives management quick access to capital when the right deals come along. This facility doesn't directly increase the company's debt, though it will expand its available liquidity by about $500 million. Second, the $1.3 billion secured notes does a couple of things. First, the majority of the proceeds will be used to refinance debt on term loans and its unsecured credit facility at lower rates. Second, it will allow the company to extend the maturity dates of that debt well into the future, with $600 million in 3.95% notes due in 2023, $200 million in 4.25% notes due in 2028, and $500 million in 4.95% notes due in 2048. So while it won't exactly have lower debt, its balance sheet will be improved with lower rates and extended maturity dates. Just as it did one year ago, Welltower continues to have the inexorable momentum of demographics on its side. The U.S. Census bureau says the population of Americans 85 and older is going to double over the next 20 years. This segment of the population consumes around $35,000 per year in healthcare dollars on average and will require substantially more facilities and trained caregivers to support in the future. While not wholly aimed at this one segment of care, Welltower is particularly focused on memory care. People over 80 tend to suffer from Alzheimer's and dementia at much higher rates than younger persons, and there have been, unfortunately, far too few medical breakthroughs in treatment to date. As life expectancy continues to increase, scaling up our ability to care for the increased number of people who suffer these illnesses will be critically important. Welltower and its healthcare partners plan to be a major provider of memory care. At 18.8 times trailing funds from operations, Welltower shares aren't cheap by any stretch. If we peel back the layers a little bit, today's price is a little more palatable: The current price works out to about 15.8 times management guidance for normalized full-year 2018 funds from operations. But even at that valuation, Welltower isn't cheap. Furthermore, there's likely to be more restructuring with its existing assets that could negatively impact cash flows more in the near term than its growth efforts are delivering in gains. 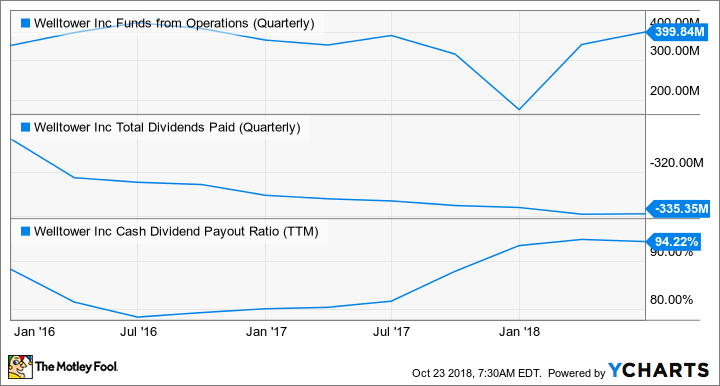 But with those near-term risks, investors who buy today would be rewarded with a 5.5% dividend yield I don't think is going away anytime soon. It may be some time before a payout increase as management prioritizes getting its asset mix in order before it fully enters into its next growth phase, but in time, that should pay off. And once Welltower's cash flows start cranking higher again, I expect investors who bought at even today's "not exactly cheap" prices to be happy they did.